When you engage Greg Koorhan for an interview for your podcast or article, or to present at your conference, seminar, or event, we make it easy to promote! We have assembled the most commonly asked-for resources to help you put together your handouts, posters, emails and ads. Of course, if you don't find what you need below, please feel free to Contact us. 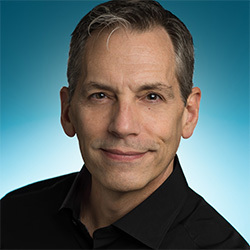 Greg Koorhan is an award-winning filmmaker and co-founder of Crossbow Studio, an independent film and video production company specializing in uplifting stories that inspire, educate and entertain. He is also the founder of ProfitArcher, a digital marketing firm focused on helping you generate leads for your business by creating compelling content aimed straight at the heart of your audience. 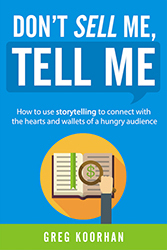 He is the author of the #1 best-selling book, Don't Sell Me, Tell Me: How to use storytelling to connect with the hearts and wallets of a hungry audience. As a speaker and coach, Greg is happiest when he is sharing his 30+ years of storytelling, marketing and brand-building experience to help you shortcut the process of finding your voice and rewriting the future of your business and life. When he's not helping clients share their unique story and build their businesses, he's either hosting neighborhood movie night or writing and developing his next film project. To download, simply right-click (Mac: CRTL+click) the links below the images and select “Save As” to store to your computer. Do you want to stand out from a sea of competitors, and not just sound like everyone else? Are you tired of being the ‘best kept secret' in your market? Business owners and entrepreneurs – learn how to use storytelling techniques to build trust with your ideal audience, engage hungry buyers and build a consistent, unique and authentic brand. Packed with pragmatic advice you can put to use right away, you’ll learn how to keep your most profitable audience eager and ready to hear from you. To download, simply right-click (Mac: CRTL+click) the links below the image and select “Save As” to store to your computer. To download, simply right-click (Mac: CRTL+click) the link below and select “Save As” to store to your computer.